The dental patient with his pathology, his needs and his demands represents the point of departure for the research and innovations in dentistry. He is the most important recipient of the clinical advancement and innovations achieved through medical science. 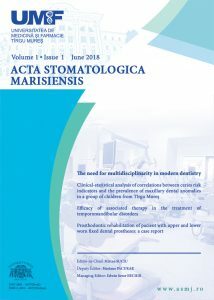 This journal is meant to provide the scientific content and peer-reviewed research to improve clinical outcome, as well as treatment planning options, in order to enhance success of dental treatment .